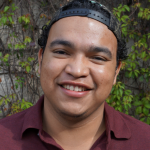 Cristian is originally from Palín Escuintal and was selected as a GOJoven Fellow when he was 17 years old. He is an undergraduate student taking an English course at CALUSAC. Beginning in 2017, he began to show interest in the topic of Sexual Health, specifically in HIV and now volunteers for a Spanish foundation that focuses on this area. This scholarship has brought him much knowledge, including empowerment on social injustice and visibility of the youth population. GOJoven Guatemala provided him another opportunity to promote and provide contraceptive methods and counseling for Sexual Health and Reproductive Health. Recently, In 2018, Cristian participated in a call in Lima, Peru, and received training in the political advocacy process for the defense of sexual rights and reproductive rights, as well as participation in the Third Meeting on Population.